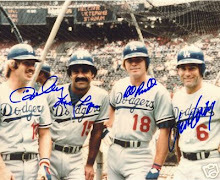 garvey cey russell lopes: how about the foldouts from the steve garvey binders? 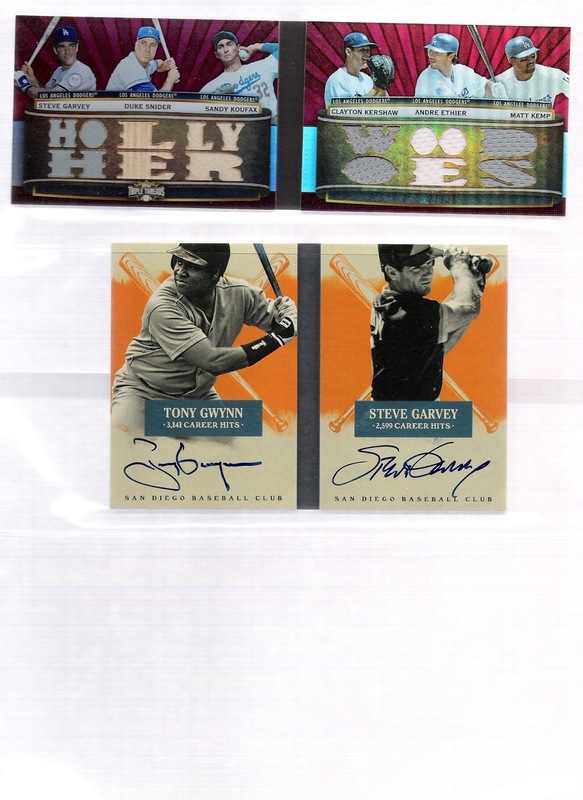 how about the foldouts from the steve garvey binders? foldout cards kind of ticked me off when they first started showing up. what good are they if they are to remain folded up? 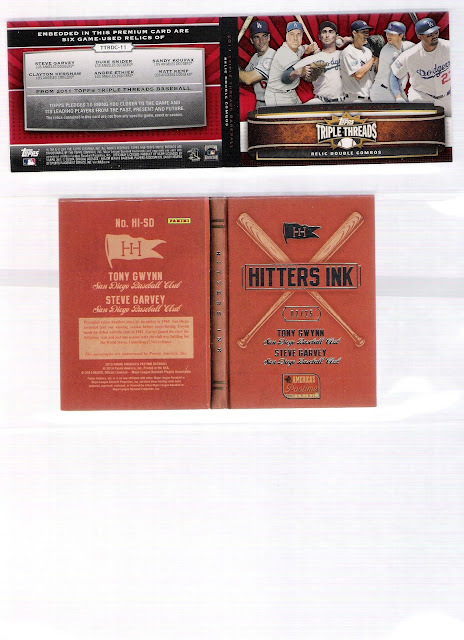 i remember seeing some hard cases that would display the cards, but i'm a binder guy, not a hard case sort. it's a good thing, then, that i found some 3-pocket pages (not the postcard kind) that work well with these things. three cards that celebrate the teams of my youth - mainly the 1977 and 1978 pennant winning years. you know that i am a big fan of the timeless teams set, and i sure would like to find the other versions of that foldout relic card. 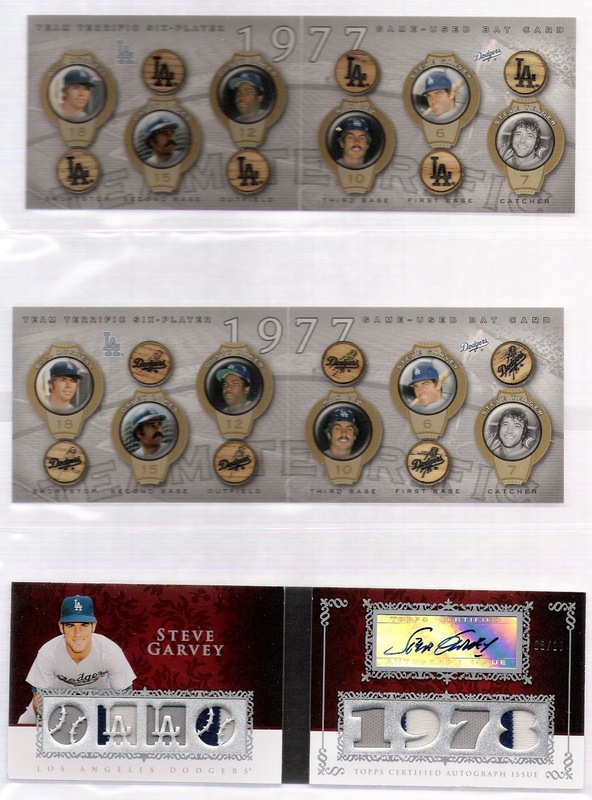 there's a version with the timeless teams brand (/35) seared into the bat pieces as well as one with the national league logo (/15), and one with stats (/5) - although i'm not sure what the stats one looks like. i was a bit disappointed to find that the sterling card wasn't a patch card, but rather just material from the team's away jerseys during the time that they had color at the base of the sleeves. i really should move that hitter's ink booklet to a 2-pocket page. 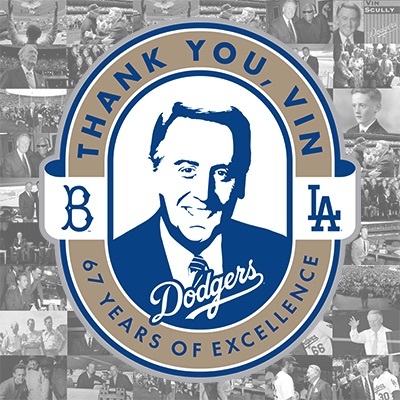 i find it interesting that over steve garvey's career, he only had two teammates (for any substantial amount of time - i'm not counting the likes of jim bunning, hoyt wilhelm and frank robinson) who made the hall of fame - don sutton and tony gwynn. and with this gwynn card, i have dual auto cards for garvey and both of those teammates. i mentioned before that i'll have a living post for my garvey collection that i'll update as i add cards. it will be more for my use than anyone else's, i imagine, but it will be cool to have it all in one place. Normally... 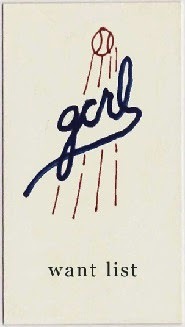 I'd say my favorite card in this post is the one featuring Gwynn. 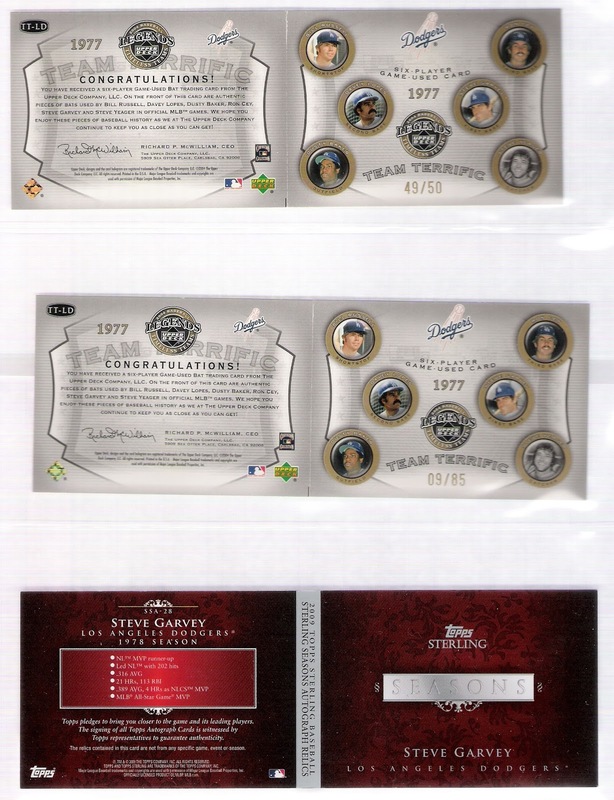 But those 2004 Timeless Teams relic cards are awesome!